This fun face paint in a large crayon form comes in your choice of color schemes: Brilliant, Vivid, Pearl, or Bright. 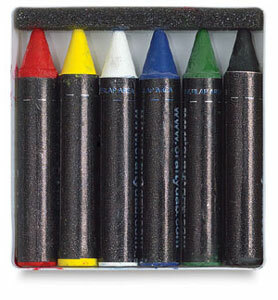 Each package includes six crayons. Formulated with the highest quality ingredients to ensure professional-looking results, they also have skin conditioners such as lanolin and beeswax. You'll find them as easy to apply as they are to wash off. Crayons are non-toxic and hypoallergenic. ™ Crafty Dab is a trademark.